Ivan Menchell’s play features three Jewish widows in New York so you know as soon as the curtain rises that the dialogue is going to be laced with a particular kind of humour. The women kvetch and take verbal swipes at each other in a gently amusing manner. There is Lucille (Shirley-Anne Field) who is all fur coat and high heels, claiming to live life to the fullest by ‘playing the field’. There is Doris (Anne Charleston – Madge off of Neighbours) who is still hopelessly devoted to her late spouse to the extent that it impinges on her every mood. There is Ida (Anita Harris who must be gene-spliced with Peter Pan) who is willing to make tentative steps into moving on with her life. They make for an amusing trio and pleasant company. The plot doesn’t really go anywhere. Every month the women meet at Ida’s home and travel together to the cemetery wherein their husbands are buried. They meet widower Sam (Peter Ellis, whose Noo Yoik accent was the most consistent) and he and Ida embark on a cautious romance. This budding relationship is thrown into brief jeopardy when the other two women warn him off, but after an almighty piss-up at a friend’s (offstage) wedding, recriminations and reconciliations are made. 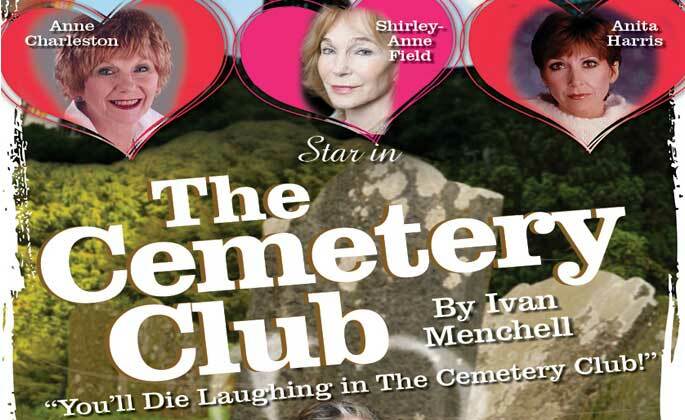 It takes the death of one of the women to make the survivors disband the Cemetery Club and get on with their lives. It has taken them long enough. Shirley-Anne Field is very good as glamorous but brittle Lucille. Anne Charleston has a voice like peppered chocolate, rough and rich and well-suited to her sardonic character. But for me the real treat was seeing Anita Harris sparkle as the cautious, nervous Ida, suddenly finding herself an awkward schoolgirl again as she comes out of her shell with Sam. Debbie Norman’s cameo as Mildred, Sam’s alternative date to the wedding, is such a striking portrayal you wonder what Sam sees in her. Her laugh could chop liver and her scene injects energy into the second act. All in all it was a pleasant if inconsequential couple of hours. I was glad to see roles for older actresses that don’t involve them posing for novelty calendars or learning how to pole dance.